WARNING: This can be a dangerous choice of application because the vacuum form can trap the airbrush ink spray and cause the client to inhale it. This choice of application is not recommended by Reel Creations. A way to use a vacuum form to apply designs is to cut it into sections and apply them one at a time leaving the nose free. Tell the client to hold there breath as in the paragraph SPRAYING AROUND THE FACE above. 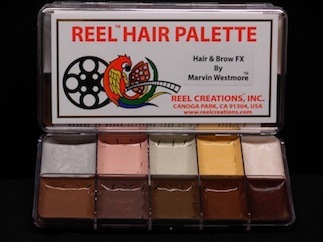 MARVIN WESTMORE has developed Hair & Brow F/X colors. These colors are now a standard item made exclusively for REEL CREATIONS.